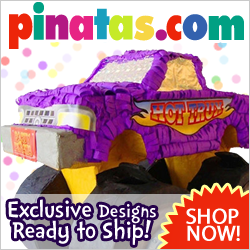 Whether you are hosting an adult or k ids indoor or outdoor party, the pinata party game is bound to be the highlight of the party. It’s a great birthday party game. Furthermore, it’s a great party game idea for any other occasion as well. Traditionally, the pinata party game is the “main feature” of a kid’s outdoor birthday party. Normally, the traditional pinata game as described below is played as an outdoor party game. The exception is when the party area is a large garage, auditorium, or other indoor facility of appropriate size. If your party game area is limited to indoors, we suggest you look at our pull pinata indoor party game.